Product #21901 | SKU MX153T-TQG | 0.0 (no ratings yet) Thanks for your rating! The Shure MX153 Earset Headworn Microphone is a subminiature, low-profile single ear-loop microphone with high gain before feedback, rich detail and clarity. The MX153 features a TQG terminated connector for use with compatible Shure bodypack transmitters. 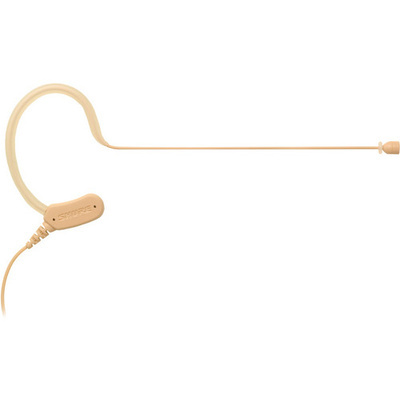 The sleek single ear-loop frame features a subminiature capsule with an omnidirectional polar pattern for optimal sensitivity and clarity at all times. The MX153 is ideal for corporate presentations, houses of worship, A/V conferencing, and live sound reinforcement applications. Polarity Positive pressure on diaphragm produces negative voltage on pin 3 with respect to pin 1.